In the 1850s, Melbourne was growing at a startling rate: the gold rush had brought an influx of hopeful migrants to the city, and building tradesmen were working longer hours in harsh conditions to keep up with demand for new buildings. On 21 April 1856, a group of stonemasons – led by James Stephens – walked off the job at Melbourne University. They marched to the Belvedere Hotel in Fitzroy, with other stonemason joining them along the way. They ended the march with a banquet at the hotel to enjoy some well-deserved recreation time, and celebrate their shared goals. [The masons] have succeed, at least in all the building trades in enforcing [the 8 hour day] without effort. 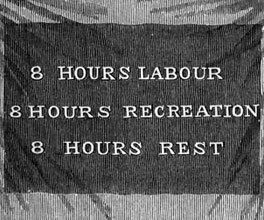 The employers have found it necessary and politic to give in, and without struggle; agreeing, we believe, to pay the same amount of wages as formerly for ten hours' labour. The title of a resource can give clues about the kind of information it contains. This quote is from a book called Radical Melbourne – ‘Radical' generally describes someone or something in favour of change, so you would expect this book to focus on the stories of people who fought for civil and political rights. The historic success of the campaign was celebrated on 12 May 1856 with a grand march from Carlton Gardens to Cremorne Gardens in Richmond, followed by dinner, speeches, games, festivities and fireworks. Known as the 8 Hours Procession, the march became a major event in Melbourne and was held annually for the next 95 years, becoming a paid public holiday in 1879. However, in 1934, the holiday was renamed ‘Labour Day' and by the end of World War II there was little public interest in the procession. The last Labour Day parade was held in 1951, and in 1955, it was replaced by the Melbourne Moomba Festival parade. In 1856, Welshman James Stephens had an idea that would change the lives of Victorian workers forever.